Despite federal disability rights protections under the Americans with Disabilities Act (ADA), disability discrimination regularly occurs in the workplace. Disability discrimination in the workplace is illegal. 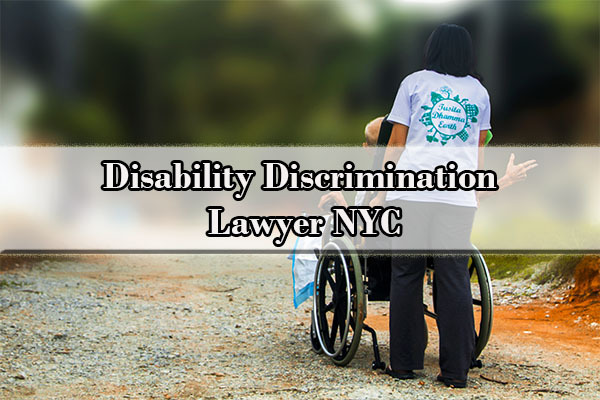 If you think that you have been discriminated because of disability, or you constantly face disability discrimination at work, you should contact a disability discrimination attorney. What Does Disability Discrimination Mean? Disability discrimination is unfair treatment in the workplace on the basis of disability. In other words, disability discrimination happens when an employer makes an important employment decision based on an employee’s disability rather than the employee’s skills, qualifications, or job performance. In addition, disability discrimination laws also prohibit disability harassment. Employers may be vicariously liable for disability-based harassment perpetrated by supervisors if the employer knows or should have known the harassment was occurring and failed to act. Which Laws Prohibits Employment Discrimination Based on a Disability? The ADA makes it illegal for an employer to refuse to hire, fire, demote, reduce pay, reassign, or otherwise deny workplace benefits or perks to an employee simply because that employee is disabled in some way. Additionally, many state and local laws also protect disabled individuals from discrimination in the workplace. For example, the New York State and New York City Human Rights Laws provide disability discrimination protections. The ADA does not allow companies with 15 or more employees to discriminate on the basis of a disability or perceived disability. The New York State and New York City Human Rights Laws additionally cover all employers who employ between 4 and 14 workers. The ADA and the majority of state discrimination laws only provide protection for qualified disabled workers as well as workers who “are regarded as” or “perceived as” disabled. The ADA defines a disability as a physical or mental impairment that substantially limits one or more major life activities. The term also applies to any employee who is regarded by his or her employer as disabled, even if the employee does not actually fit the definition. This broad definition means that many people who do not consider themselves disabled may still find protection under the ADA. The law applies to both full-time and part-time employees. Are You “Otherwise Qualified” to Perform the Job? Discrimination occurs when an employer takes action against a worker because of the worker’s disability, despite the fact that the worker is otherwise qualified to perform the job. “Otherwise qualified” means that the worker is able to perform the essential functions of that position with or without a reasonable accommodation. If there is no reasonable way a person with a disability could perform the essential functions of a job, even if the employer makes reasonable accommodations, it is not discriminatory to deny the person the position. Is your disability or condition covered by the ADA? You can find out by contacting an ADA lawyer in New York. ADA discrimination is more common than many people want to believe, and disability discrimination attorneys can assist in resolving your claims. The ADA requires that employers provide reasonable accommodations to employees who they know have physical or mental limitations. An accommodation is an adjustment to the workplace that allows a disabled employee to perform his or her job. Whether an accommodation is reasonable, however, depends on the degree to which an accommodation would disrupt the employer’s operation or result in unreasonable cost. What Are Examples of Discrimination Against People with Disabilities? Refusing to purchase additional equipment that could accommodate an employee’s disability. What truly matters is not the actual disability an employee or job applicant has, but whether the employee or job applicant is qualified and able to do the job with or without an accommodation. If you believe you may have been discriminated against on the basis of your disability, call a New York disability discrimination attorney today for a consultation about your right to recover damages from your employer. While these are simply examples of what could happen, disability discrimination attorneys can help you determine whether you have a claim based on your own experiences. You can also fill out our law firm’s contact form to alert our ADA lawyers to your claim. The ADA also prohibits perceived disability discrimination, an area of law which has seen considerable development in recent years. Perceived disability discrimination occurs where an employer believes an employee has a disability and discriminates on that basis regardless of whether the employer is correct that the employee’s perceived condition is actually a disability. Perceived disability discrimination can occur either because an employee has a past record of having a disability or because an employer erroneously believes that a certain condition constitutes an actual disability. For example, if a job applicant has a record of childhood asthma, but no longer suffers from shortness of breath or other respiratory problems, it would be illegal to not hire that applicant solely because of asthma-related concerns. Many of our clients find the notion of perceived disability discrimination confusing. If you are unclear about your rights under the ADA, call a New York disability discrimination attorney to learn more about your case. an understanding of what evidence is needed. Direct Evidence: Direct evidence is a “smoking gun,” such as an e-mail an employee was accidentally cc’d on that contains derogatory comments about a disabled employee or a letter from an employer explaining that a disabled employee was fired due to his or her disability. While this kind of evidence is rare, it will conclusively prove discrimination. Circumstantial Evidence: In the absence of direct evidence, discrimination may be proven with circumstantial evidence, which is evidence that relies on an inference to connect it to discrimination. Evidence that a disabled employee was qualified for a position, but was replaced by or passed over for the position in favor of someone who was less qualified but also not disabled. Once you have determined that you have evidence to support your claims, you should fill out our law firm’s contact form on this webpage. The contact form will alert our ADA attorneys to the nature of your claim and you will be contacted regarding the next steps in the claims filing process. Disparate Treatment: Disparate treatment disability discrimination is when one is intentionally treated differently than his or her coworkers in the workplace on the basis of a disability. Disparate Impact: Disparate impact disability discrimination in when an employer implements a neutral employment policy that applies to all employees equally but in practice adversely affects a disproportionate number of disabled employees. Even though the policy does not appear to discriminate against disabled employees on its face, it ultimately has that effect. For example, an employer policy relating to the use of a time clock to punch-in and punch-out may discriminate against disabled employees if the clock is positioned so that employees in wheelchairs cannot reach it. In New York, under the ADA, an employee must file a charge of discrimination with the Equal Employment Opportunity Commission (“EEOC”) within 300 days of the most recent discriminatory act. Once a Notice-of-Right-to-Sue is received from the EEOC, an employee must file his or her lawsuit within 90 days. Under the NYS and NYC Human Rights Laws, an employee must file a claim in court within three (3) years of the last discriminatory act. If you think that you have been discriminated in the workplace because of your disability, you should seek a professional evaluation of your possible disability discrimination claims. Contact NYC discrimination lawyers and request a free consultation. We at the Law Office of Yuriy Moshes work in the greater New York City area including all of the boroughs of New York City (Manhattan, Brooklyn, Queens, the Bronx and Staten Island) as well as Northern New Jersey, upstate New York, and Long Island. Do not waste time. Contact a disability discrimination lawyer for a free consultation and get a professional evaluation of your possible disability discrimination case. During the consultation, we will help answer your questions, explain the disability discrimination laws that apply in your situation, and discuss all of your legal options.